De Ciccio Family Auditorium, Salomon Center for Teaching 101. Doors open at 4:30 p.m.
Tickets required and available at elizabethwarrenbrown.eventbrite.com. Backpacks and large bags not allowed. Brown or government-issued ID required. 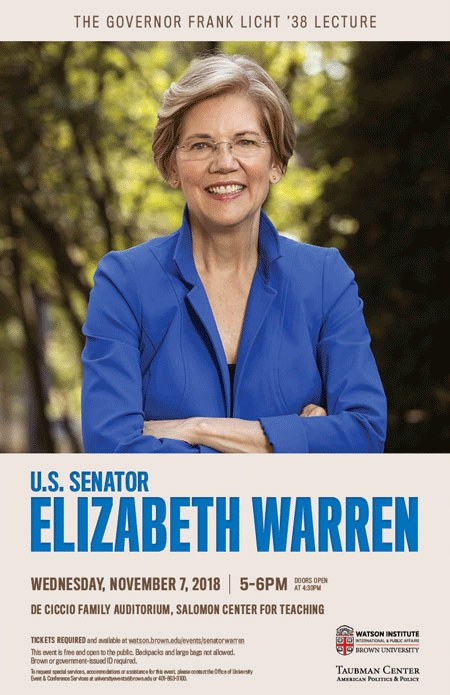 Elizabeth Warren is the senior senator from Massachusetts and a fighter for working people, serving since 2013. Elizabeth grew up in a family hanging on by their fingernails to their place in the middle class. Elizabeth was a law professor for more than 30 years, including nearly 20 years at Harvard Law School. She is one of the nation’s top experts on bankruptcy and the financial pressures facing middle class families. Her groundbreaking research, digging into thousands of court records of bankruptcy filings, showed that every year, hundreds of thousands of families file for bankruptcy in the aftermath of serious medical problems. In the aftermath of the 2008 financial crisis, Elizabeth served as Chair of the Congressional Oversight Panel to provide some oversight of TARP, the Wall Street bailout. She fought to protect taxpayers, hold Wall Street accountable, and ensure tough oversight of both the Bush and Obama Administrations. Elizabeth is widely credited for the original thinking, political courage, and relentless persistence that led to the creation of the Consumer Financial Protection Bureau. As an assistant to President Barack Obama and special adviser to the Secretary of the Treasury, she led the establishment of the consumer agency. She’s also become a national leader in the fight to create a level economic playing field for working people across the country. Drawing on her experience successfully taking on the financial industry even in the face of fierce opposition from Wall Street and big corporations, Elizabeth has effectively fought to expose big banks, fraudulent lenders, and greedy for-profit colleges that have preyed on borrowers, students, members of the armed services, and taxpayers. Her work has resulted in real accountability for executives at Wells Fargo who conspired to defraud customers, changed rules to help prevent taxpayer bailouts of Wall Street risk-takers, led to new laws to protect students from being ripped off by predatory institutions, and helped tens of thousands of people get their money back when they were scammed. Meanwhile, she’s helped lead the charge for tax policies that reward work, not wealth; for child care and paid leave laws that help working parents balance career and family; equal pay for women and fair treatment for all employees; new protections for homeowners and retirees; and measures to help consumers get a fair shake when they face powerful corporations. In Massachusetts, Elizabeth has led efforts that have secured significant federal funding for job-creating infrastructure investments, to strengthen key Massachusetts industries, such as fishing and medical research, and to increase support for the fight against opioid addiction. The fight for a fairer, stronger economy – where anyone who works hard has a real chance to get ahead –is Elizabeth’s fight, and she’s proud to wage it in the Senate every day. Senator Warren is a graduate of the University of Houston and Rutgers School of Law. She lives with her husband Bruce Mann in Cambridge and has two children and three grandchildren. The Governor Frank Licht ’38 Lecture was established in 1987 by friends and family in memory of Rhode Island Governor Frank Licht, a 1938 Brown graduate. Past speakers include then-Senator Barack Obama, Democratic strategist Donna Brazile, Massachusetts Governor Deval Patrick, and Congressman Adam Schiff.